River Jet Boating Forum • View topic - Introduction and Engine Sale! Let me take a minute to introduce myself to you all. My name is Tim Piver, new to this forum and fairly recent addition to Pacific Powertrain Inc. here in Asotin, WA. Excited to be here. A little background on me: Powersports junky all my life as well as fishing and hunting guide and TV host on a few outdoor channels. Was a Survival Instructor in the military, owned a construction company and some other small businesses for about 17 years before I helped to build 509, INC based out of Spokane, WA for about 5 years. I am here at PPI to help bring this company to a new level of available products, service, and true reliability you want from a supplier. Snakeriver and MarkH2000 have started a great company and hopefully have served all of you well that used PPI products and service. You can trust that PPI will grow and improve dramatically more over the near and far future as we continue to build success and support here by adding some of the most well known names in the industry to our team. To celebrate our recent growth in sales and team, we are going to do a sale that may never happen again. 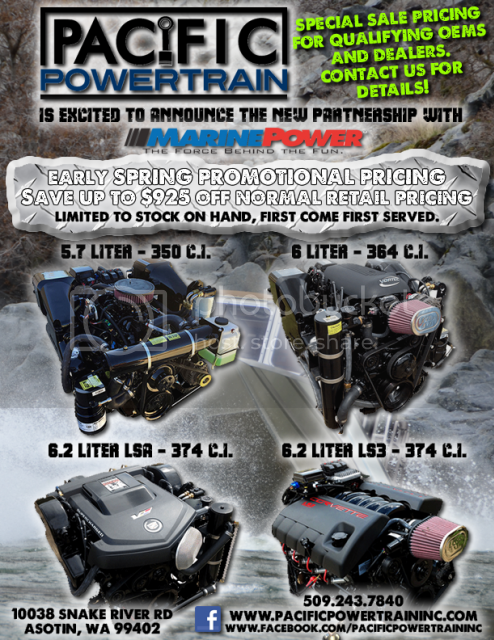 Recently as MarkH2000 mentioned a little while back, PPI has teamed up with Marine Power Engines to not only distribute the product, but help with R&D and create a new direction and level of quality with the product, as well as establish ourselves as the premier engine supplier for our industry. This is a bold and large commitment by both PPI and Marine Power Engines to you, and we intend to make it happen together. We want to earn your trust and your business. To start this off right we are offering a limited time sale based on available product, limited to current inventory. Please see the flyer below. Any questions, please do not hesitate to call and speak with one of our staff here and we will do our best to answer all of them. I am very excited for the warmer weather, living on the river as much as possible, and meeting many of you over the coming year. Please reach out and introduce yourselves if you wish, I would appreciate it. Thank you for your support! Last edited by bigbull on Mon Feb 09, 2015 9:43 am, edited 1 time in total. Re: Introduction and Engine Sale! So your the guy to blame for those POS sledding goggles I bought because of all the hype Congrats on joining the PPI team and I hope you guys have great success.